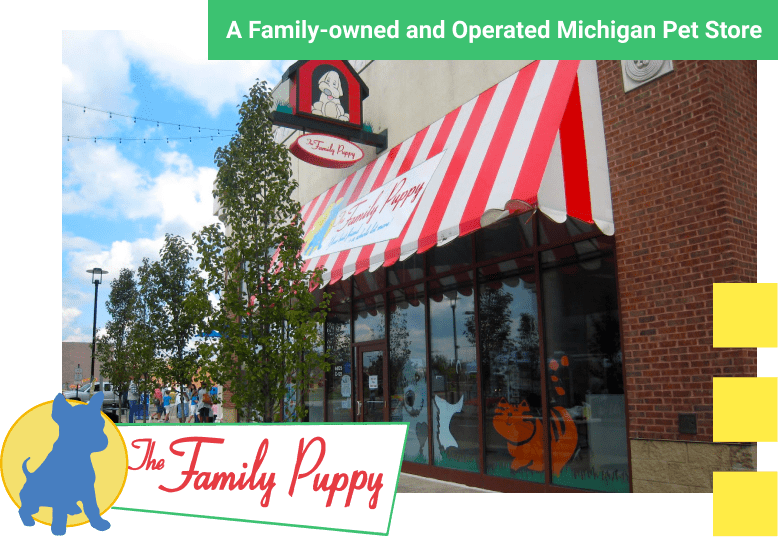 The Family Puppy - Michigan's Local Family Pet Store. Celebrating 40 years of helping families find the puppy of their dreams! 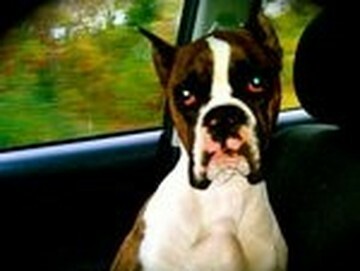 FREE vet visit & FREE veterinary care vist after the purchase within 30 days. We provide a 30-Day Insurance Certificate for health care coverage and offer 2-Year Protection against genetic health defects. Our puppies are given a physical by licensed veterinarians to screen for health issues prior to accepting them from the breeder. Once in the stores they have a veterinarian visit every week until they find a home. Puppies comes with the AKC Good Dog lifetime subscription helpline access. An unlimited personal consultation service with a professional trainer and E-Course program designed to equip you with answers to any questions. We microchip all our puppies and have since the day we began in 1998. Microchips are a safety net and enable any lost puppy to be traced back to the owner. We implant and register the microchip for you in the lifetime AKC Reunite Recovery system with all the fees are included in our price. This is Teddy (actually Ted E Lee) He is a very lovable Schnauzer! We got him from the Novi location. We got him to give our other Schnauzer a playmate thinking it would help. What we realized is that not all Schnauzers are crazy. Teddy loves kids and you were right, the socialization you all do at the store makes a difference! Our first Schnauzer was from a private breeder and must have not been socialized. Thank you so much for the service you provided to us! I brought "Hendrix" home from the Family Puppy of Brighton. The staff was wonderful and helpful with choosing the perfect puppy for me. Hendrix has been nothing but amazing. We bought Harley (a puggle) at the Genesee Valley Store in Flint. 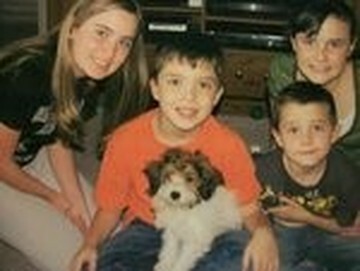 He is such a loving dog and loves his twin sisters who are 12 and his younger sister who is 10. We also have a black Lab, and Harley gets along great with him. In fact, Harley does not like to be in a kennel by himself while we are away. He would rather sit in the same kennel as his older brother and cuddle. I highly recommend considering a dog or a kitten from this store. If I could afford another one I would go get one today! 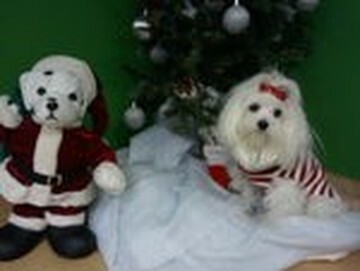 We absolutely love our Sasha the Maltese! Everybody that meets her loves her too! 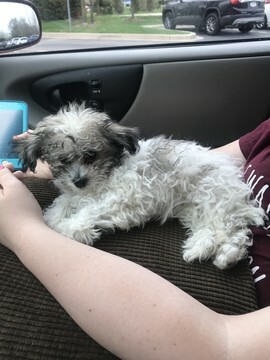 We purchased her from the Flint store and everyone there is so helpful and well educated about making sure we got the right puppy. We are very happy with our decision! We purchased Buddy from the Flint Family Puppy! We absolutely love him! He loves messing with mom's Christmas tree and ornaments and his favorite toys consist of my slippers and collectible magazines... but we wouldn't trade him for the world! We wandered into The Family Puppy one Saturday after long talks about adopting a little puppy. 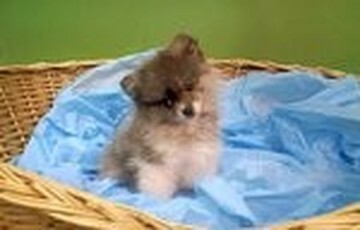 When we first saw little "Husky" a pomeranian, we thought he was the cutest dog we had ever seen and couldn't leave the store without him. The staff were very helpful and informative and we took advantage of the 24 hour questions service; we're first time puppy owners. But since we've brought him home he has completed our family, it's like we brought home a baby. Sweetest Schnaltie (Schnauzer x Sheltie)! 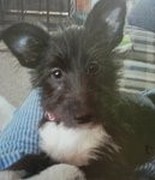 Molly is adorable, loves to play, and she's a cuddler when we're ready to settle down for the night! All of the Family Puppy Flint's puppies were friendly and nice. They were all good to the kids and liked to be around people! We love Parker so much! He kisses us all and loves to play. Thanks to the Family Puppy Flint! 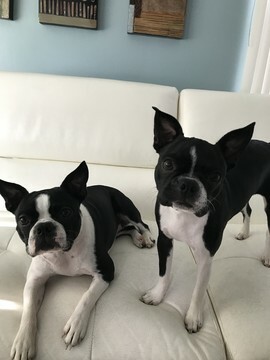 We purchased our first puppy in April from the Novi store so happy with our first puppy we purchased a second puppy in January ....they are fantastic together and they are sisters!! Best friends - both from the Novi Store. Apollo is almost 2 and Koda is 4 months old. 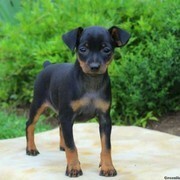 Durin is our Min-Pin we purchased from the Flint store. He is our heart and soul. Best puppy we've ever had! We bought Emma from the Troy location for our neighbor and she is the best thing that’s ever happened! Ivy was so helpful and were so grateful she helped us find Emma! Thanks to Shawndra, she helped me pick the perfect pup at the Family Puppy in Flint, MI. 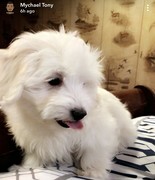 She answered all questions and pointed me to the perfect little coton de Tulear. 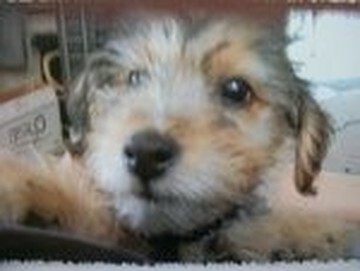 This is my 2nd dog from the family puppy, both coton de Tulears. Will be back again!